I used the 2x telecon and the 70-200mm lens (making it 400mm F5.6), but the stage wasn't bright enough, as it was in the shade. (;_;) So I switched between using the 400mm F5.6 and 300mm F4. The 300mm was bright enough, but then everyone is pretty small.. I arrived in Shibuya around 11:00. At around 11:45 or so, all of the girls came to the GIGO game center. Then the rehearsals started before 12:00. Since the street wasn't closed off until 12:00, I had to go across the street to watch the rehearsals. The stage is on the second floor, facing the street. All the girls did the rehearsals in their street clothes. At 12:00, all the people with cameras moved into the middle of the street. It would have been nice to have a step ladder, so the angle would have been better. I raised the tripod as high as it will go, and put the Hi8 camera on it to take a video of the stage. 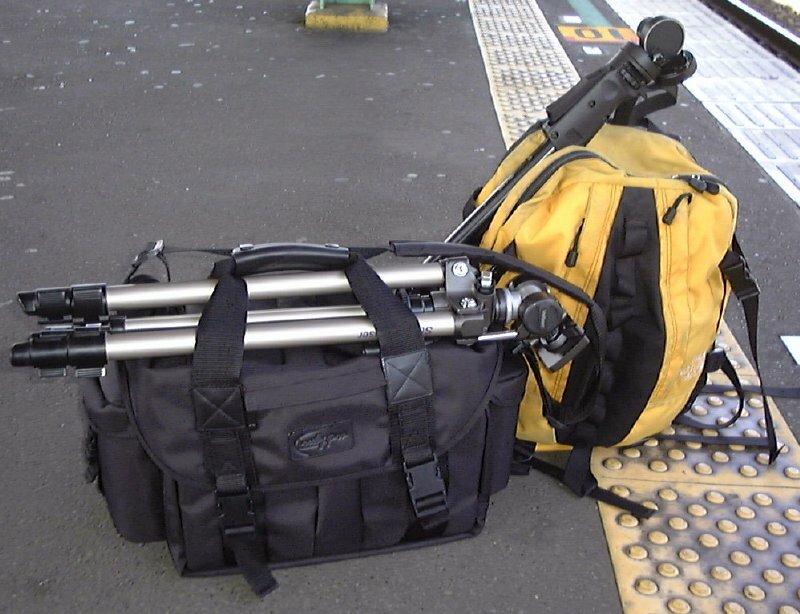 Everyone else had nice DV cameras, so my 200 Kyen Hi8 camera was like a cheap toy. (;_;) I just left the video facing the stage (mostly centered around Nobuko), and concentrated on taking pictures. The rehearsals lasted until 12:30 or so. The first event started at 13:00 and lasted less than 40 minutes. The girls who were on the stage were: Mieko, Sayaka, Jun, Mayo, Nobuko, Natsumi, and Mae. Sora and Sara were on the street passing out flyers. Everyone was wearing the Kira Melo school uniform, with the blazers on. The event was just songs. There wasn't much talk at all. The songs were: Daisuki (everyone), Pride (everyone), Soba ni Itai (Mayo), Idol ha Kitto Sekai wo Sukuu (Heart Chu), Kira Kira (Heart Chu), Daisuki (everyone). The second event started at 14:00. Everything was the same, except for the girls. This time it was: Mieko, Sayaka, Jun, Mayo, Mae, Sora, Sara. Sara sang Nobuko's parts. Nobuko and Natsumi came down to the street to pass out flyers. Also the girls had taken off the blazers, as it was really HOT. The third event started at 15:00. The girls were: Mieko, Sayaka, Jun, Mayo, Nobuko, Natsumi, Sora. Sara and Mae were down on the street passing out flyers.